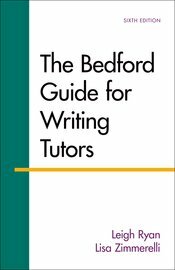 With expanded coverage of teaching in the information age and teaching multilingual writers, as well as a new chapter on research in the writing center, the Sixth Edition of The Bedford Guide for Writing Tutors addresses the needs of writing tutors as both teachers and scholars. This concise and practical introduction to tutoring in today’s diverse, multimodal writing environment includes numerous exercises and activities to help tutors develop their tutoring techniques and reflect on their teaching philosophies. Meanwhile, cartoons and tutoring examples throughout the text engage and entertain both experienced users and new tutors alike.